Settings: Formula 24, Render 4 Orbit Counting, Color 24-4 modfied. 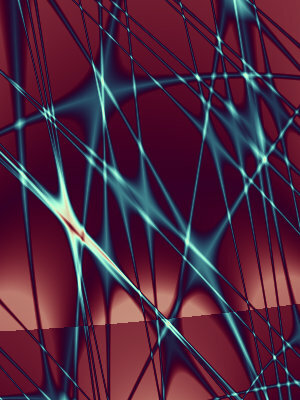 I like exploring these forests of cables that the Orbit Counting formulas produce. There is a sunlight and shadow effect which produces a very realistic-looking three-dimensional image. This one is also another example of a low color-mixing render value, in this case 0.300.